Andrews Field was a baseball park in Fort Smith, AR and was the home field of numerous professional baseball teams from 1921-1955. Andrew’s Field was home to the Fort Smith Twins from 1921-1932, the Fort Smith Giants from 1938-1949, the Fort Smith Indians from 1951-1952 and the Fort Smith-Van Buren Twins in 1953, all of the Western Association. The field replaced Stadium Park, were professional baseball teams in Fort Smith called home from 1916-1920. The wooded Stadium Park was a fine ballpark, possibly the best in the Arkansas at the time, but by the 1910’s, ballparks were being built of steel and concrete. Fort Smith, a good sized town with a population of about 30,000 at the time, followed that trend and built a new ballpark, a ballpark that would become known as Andrew’s Field. The leader of the movement to build the new ballpark was John M. Andrew, a local athletic director in Fort Smith. With some help from local organizations, $25,000 dollars was raised to build an all-new steel and concrete stadium, the first of it’s kind in the state of Arkansas. Rightfully, The field was named in his honor. The ballpark was built at the corner of South B Street and South 5th Street, only a fifth of a mile from the Arkansas/Oklahoma border in what is now the historic district of Fort Smith. In addition, it was built only a couple of blocks away from where Stadium Park was located. Andrew’s Field was supposed to be completed by the spring of 1921, but was uncompleted by the start of spring training. The Omaha Buffaloes held their spring workouts at Andrew’s Field that year, but they ended up training on a construction site. While they practiced there, a roof to cover the grandstand was being built, and lumber from the construction was spread throughout the ballpark, including on the playing field. By opening day, Andrew’s Field had the finest grandstand in the league, and likely all of Class D. The concrete grandstand sat about 1,500, complete with box seats and a press box. The park was dedicated in a benefit game between the Fort Smith Twins and the Henryetta Hens on Friday, May 20th, 1921. But while the ballpark was truly a gem of a diamond, it lacked quite a few essentials. The field itself was mainly bare without grass, giving it the appearance of a gravel pit. But an even bigger problem was that the players had no dugouts to protect them from the fans. The lack of dugouts at Andrew’s Field caused quite a few problems in September of 1921. On one particular occasion, the Fort Smith Twins won a 3-2 game in the 10th inning. When they did, the fans in the grandstand proceeded to throw things at the visiting team, the Henryetta Hens, and even hit the players with glass bottles. The next day, the local newspapers recalled the accounts of the game and discouraged fans to attend to games because of such riots, which of course did not go over very well with the Twins’ owners. Their solution then was to not allow the news reporters into the press box or even the ballpark. The whole matter was resolved when John Andrew, president of the Board of Education that operated the ballpark, returned from a vacation and allowed the newspapers admittance to the ballpark. Overall, Fort Smith had a fine inaugural season, going 83-61 and finishing second in the Western Association under the management of Clarksville, AR native Boss Schmidt. They played Chickasha in the league championship, but lost to them in the 7th game of the series. Over the years, grass eventually grew in the diamond and dugouts were installed. Bleachers were also installed down the baselines and until Ray Winder Field opened in Little Rock, AR in 1932, it was considered the finest in Arkansas. 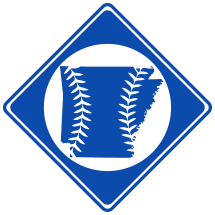 A law banning the play of the baseball on Sunday in Arkansas had been plaguing professional baseball teams in Arkansas since 1885. But Fort Smith found loophole in the law: Simply don’t play their Sunday games in Arkansas. Instead, play their Sunday games across the Arkansas River in Oklahoma. The problem was how to get enough fans across the river to make the games worth playing. Fort Smith’s answer came in 1922 when the Garrison Avenue Bridge and a trolley line across the river opened. So Fort Smith built themselves their second new ballpark in 2 years. The ballpark, known as Arkoma and Alexander Field, was built in Moffett, Oklahoma, a tenth of a mile from the Arkansas border, and sat 2,000 people. The Fort Smith Twins went on to play the Western Association until 1932 before moving to Muskogee and becoming the Chiefs. Andrew’s Field saw the Twins win two league tittles in the amount of time, once in 1927 and once in 1929. But while Andrew’s Field had no permanent baseball tenant, the field was still used for amateur baseball as well as other activities, including football. In 1936, the New York Giants, on their spring exhibition tour, played a game at Andrew’s Field against the Cleveland Indians. The game must have been well attended because the Giants and the Indians came back again in 1937 and every afterward year until 1942. In 1938, the New York Giants picked Fort Smith to be the location of an expansion team in the Western Association, giving Fort Smith its first professional team in 5 years. They were rightfully named the Giants. The Fort Smith Giants won the 1942 Western Association Championship under the management of Baseball Hall of Famer Fred Lindstrom. But that would be their last season for 3 three years due to World War II. The Giants returned in 1946 and continued playing until 1949. They did not play 1950, but returned in 1951 as the Fort Smith Indians with an affiliation with Cleveland, which lasted only until 1952. Andrew’s Field saw its final professional Fort Smith team in 1953, this time known as the Fort Smith-Van Buren Twins. They went only 49-90 on the season and averaged less than 500 people a game. No professional baseball team has called Andrew’s Field home since. Andrew’s Field continued to stand as one of the Arkansas finest baseball fields for quite some time, but in the 1960s, a tornado hit the ballpark and wiped away everything at the ballpark except the concrete grandstand. The ballpark underwent $30,000 dollars worth of renovations in the 1970s and reopened in 1975 as a softball field for the Sebastian County Softball League. Within the last few years, the idea of bringing professional baseball back to Fort Smith has been tossed around. Unfortunately, Andrew’s Field is gone. Instead, a new ballpark, located on the banks of the Arkansas River, may soon be the new home of minor league baseball in Fort Smith. The site of Andrew’s Field is now the final resting place of this country’s veterans. The field itself had a long, historic life, and a monument may be placed there to remind those of its legacy. Ninety years after it opened, the ballpark is still a site representing what baseball stands for: America, land and the free, home of the brave.